Age: it is the most common cause of obstruction in children 3 months to 6 years old, but the majority are younger than 24 months. Season: more common during respiratory and gastrointestinal virus seasons. In children, this may be indicated by drawing knees to chest and crying. In many cases, giving an air enema will correct intussusception. Air enema is preferred over water-soluble contrast or barium enema. This is often the preferred treatment when intussusception occurs in infancy. However, the test may occasionally cause a perforation to occur in the bowel. No form of enema should be done if the doctors know the bowel is perforated. 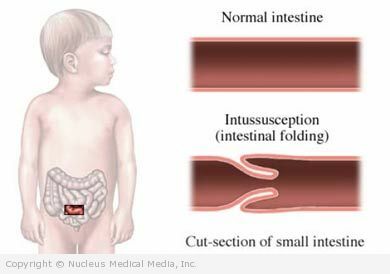 After any treatment, intussusception may recur. Antibiotics may be administered and a nasogastric tube placed prior to attempted reduction. If you are diagnosed with intussusception, follow your doctor’s instructions. There are no guidelines for preventing intussusception because the cause is unknown.